To go along with Agostino’s review, it’s time to listen again to the genius of Erik Satie, also used as a soundtrack for Agostino. 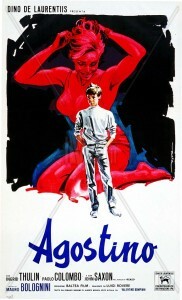 I’m very happy to announce that I’ve reviewed the first rare and underground movie of the site, an obscure italian classic, Agostino, inspired by a novel by Alberto Moravia, a very influential and prolific Italian writer who also had a very big impact on the world of cinema, both as a writer and as a critic. You can find the review, along with English subtitles for the movie (not mine), here. With pleasure, I’m announcing you the opening of the cinema section of Illusion City! Like I wrote on the last update, the first movie to be reviewed is Francois Ozon’s Young and Beautiful, a wonderful movie about the hardship of the teenage years and many difficulties and shadows of living in the contemporary world…I’m quite happy of the analysis I’ve written, I’ve found an interesting connection between this movie and one of Louis Bunuel’s masterpiece, Belle de Jour (1967), so I invite you to read it and comment it! I am planning to upload a new review every one or two weeks, depending on the spare time I’ve got…I hope you will appreciate them.